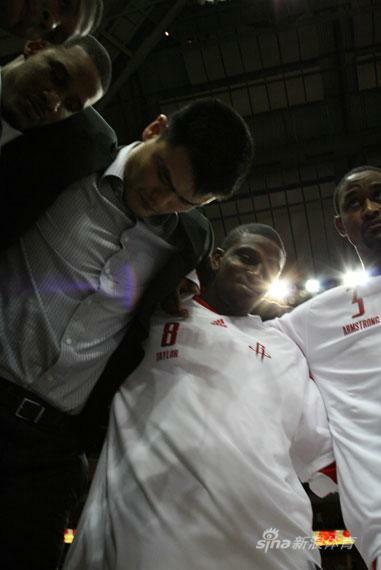 Yao is back in Houston after returning recently from China. On Thursday, he and his expecting wife Ye Li attended the Houston Rockets’ annual Tux & Tennies charity benefit at Toyota Center. 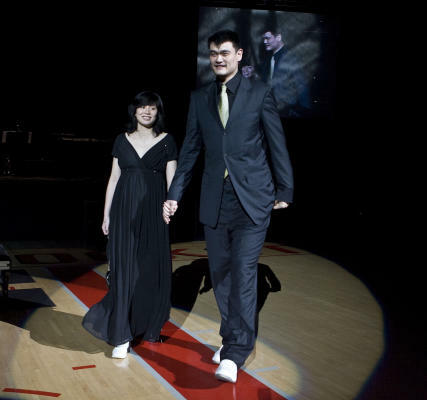 Click here for more photos of Yao, Ye Li, and Yao’s Rocket teammates at the charity gala. On Wednesday, Yao was at Toyota Center again for a game against Sacramento and former Rocket Carl Landry. Unfortunately, the Rockets lost to the 20-40 Kings. Houston has obviously hit a low point of the season with a mediocre record of 30-30 after losing 7 of their last 10 games. It’s good to see Yao again, providing hope for next season that he’s the missing piece the Rockets will need to become championship contenders again. Click here for more photos from Wednesday night’s game. The Rockets’ loss to Sacramento was absolutely inexcusable Tuesday night. It was a huge, huge loss in the Rockets’ quest to stay in the hunt for home court advantage in the playoffs since New Orleans and San Antonio both won earlier in the night. The Rockets are now 2 ½ games behind those teams with only 8 games remaining, 1 game behind the Lakers, and ½ game behind Phoenix in 6th place in the West. If the playoffs started today, the Rockets would play the third-place Lakers and would NOT have home court advantage. That’s how big these recent losses have been, including this one they should have won Tuesday, their first loss to a team with a losing record in 3 ½ months. The Rockets still managed to blow it against a team that had lost one of their best players and rebounders, Brad Miller, who got ejected midway in the third quarter because of two technical fouls. And the Kings were already playing without another big man, Spencer Hawes. Their absence in the game helped give the Rockets an incredible 49-28 rebounding advantage, including a 21-4 advantage on the offensive boards. I have never seen a team dominate on the boards like that and still lose a game! Attribute this disaster to the Rockets missing their first 10 shots in the fourth quarter, and shooting only 20% in that quarter and 40% overall. Rafer Alston penetrates into the lane and dishes for an assist against the Sacramento Kings. Alston would finish with 28 points on 9-of-17 shooting, 5 assists, and no turnovers to lead the Rockets to a 108-100 victory over Sacramento. After watching the Rockets-Kings game on Monday night, I just had to watch the second half and overtime of the Lakers-Kings game on NBA TV because of the playoff implications that game had for the Rockets. If the Lakers had lost that game like they did on the first night of a back-to-back on Sunday night against the Warriors, then the Rockets would be tied for 1st place in the West with L.A. Unfortunately, the refs made one of the worst calls I’ve ever seen that basically gave the game to the Lakers (more on that later). That ‘win’ by the Lakers might be the difference of a few spots in the playoff standings for the Rockets down the stretch given how tight the race is in the West. With other games getting top billing for the night, like Lakers-Warriors and Suns-Pistons, the Houston-Sacramento game was really an afterthought. It was strange to see one of Houston’s games being so low-profile after every game during the 22-game winning streak seemed to be the top sports story, or their subsequent games after the streak against high-profile teams like the Celtics, Hornets, Warriors and Suns getting plenty of attention, too. So Houston had to get “up” for a game against a very dangerous team on a Monday night when everyone else interested in the NBA was focusing on other games. It has all the signs of being another let-down game after the streak ended. 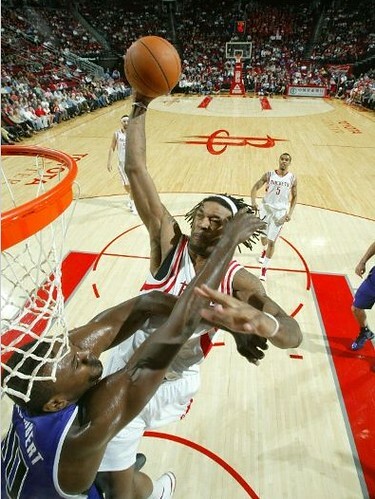 But give credit to Houston for taking care of business by beating the Kings 108-100. It wasn’t easy, though. 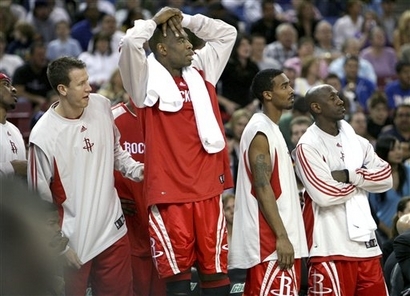 Yao Ming, Shane Battier and other Rocket teammates congratulate Steve Novak after he hit a game-winning 3-pointer to save the game for the Rockets. Houston had blown an 18-point 4th quarter lead before Novak’s shot. 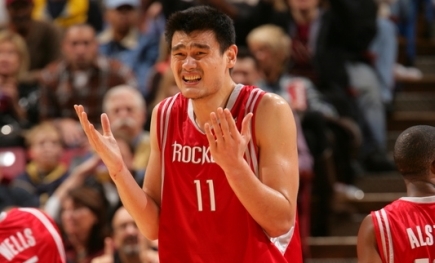 Yao led all Houston scorers with 25 points and 14 rebounds. Click here for more photos from the game. Thinking about how their recent hot streak might have been a fluke. How they were chokers when it came to winning close games. How they weren’t really that good after all, despite winning 7 games in a row coming into the game. That maybe some trades need to happen before the February 21st trade deadline after all to change the chemistry on the team so that nothing like that happens again. That’s what they might have been thinking if they had lost Wednesday night. After all, when you’re leading by 18 points against a sub-500 team, you’re expected to close the deal if you’re a good team. Especially after the Rockets had lost in similar fashion to the 76ers at home on January 15th when they had blown a 16-point fourth quarter lead. But the Rockets miraculously pulled victory out of the jaws of defeat when seldom-used Steve Novak rescued the Rockets “Robert Horry style” by hitting a 3-pointer with 2.5 seconds remaining to give the Rockets an 89-87 lead. It was one of the biggest shots hit by a Rocket at Toyota Center in years. In case you didn’t see Yao throw the towel Saturday night in Sacramento that got him ejected from the court, or didn’t see Raymond’s clip in the forum, you can check it out here. Update: the Houston Chronicle has a short article on the complaints the Rockets registered with the NBA league office on the calls that made Yao so angry. You are currently browsing the archives for the vs. Sacramento category.